When most people think about receptacles and switches, they never really associate the two together. They think that switches are primarily for a ceiling light fixture and receptacles are for plugging lamps, vacuums and televisions into. While for the most part that is true, having half of a receptacle controlled by a single pole switch can add flexibility to the design of your room. If you have an existing receptacle that you would like to control with a wall switch, then here is how to wire a split receptacle controlled by a switch. The easiest place to install your switch is directly above the receptacle you want to split. This eliminates the potential problem of running your wire through wall studs, across the ceiling or under the floor. For this example, we will be installing the switch above the receptacle, but you can place it wherever you need to in your situation. If you need guidance on how to run wire through a ceiling or under a floor, see the links in Resources below. So, the first thing you will have to do is find the circuit that is delivering the power to the receptacle. Toggle the breakers until you find the right one. Leave the circuit breaker OFF. Before you remove the existing receptacle, use the voltage tester to double-check that you got the right circuit. Now that that is confirmed you can remove the receptacle's faceplate and the two screws securing the receptacle to the wall box. Gently pull the receptacle out of the box using the top and bottom brackets. Check the wiring inside the box. If there are additional wires in the box, use the voltage tester to ensure that they are all OFF. If they are not, then find the circuit breakers that are delivering power to those wires and turn them OFF as well. If the receptacle has just one black, one white and the ground attached, then you are in luck. If it has two blacks on one side and two whites attached to the other, then you will have to pigtail some wires. For this example, we will say that the receptacle has two blacks and two whites. Loosen the screws on the receptacle and remove all of the wires. Next, use the wire strippers to cut away the exposed copper and restrip the wires (about 3/4 inches will do). Use the pliers to twist the copper of the two blacks together and then do the same for the two white wires. Tighten a wire nut over the ends of each set of wires. 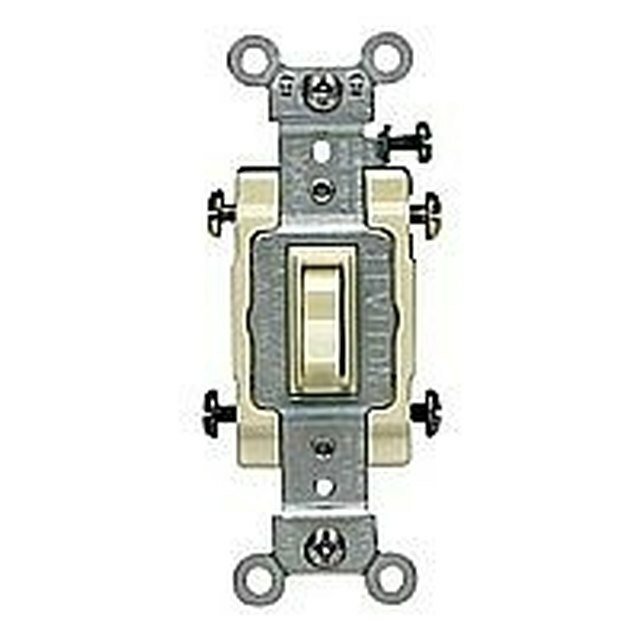 In most homes, the traditional height for a wall switch is 52 inches to center from the floor. So use the tape measure to measure from the floor up the wall 52 inches. Mark the location with a pencil. Of course, if your home features light switches installed at a different height, then measure yours and use your measurement so this new installation will not look out of place. With your outline finished, cut it out using the drywall saw. Set the box in the hole and make any minor cutting adjustments to get it to fit properly. Knock out one of the top knockouts in the existing receptacle's wall box. They can usually be popped out with a screwdriver. Once that is complete, start fishing the nonmetallic fish tape up through the knockout. Once you get enough inside the wall, try to grab the tape from the hole you created for the switch. Pull the fish tape out through the hole. Take your length of NM cable (electrical wire) and tape it securely to the end of the fish tape. Gently pull the tape back out through the receptacle box until the electrical wire pulls through. Separate the fish tape from the electrical wire and use an electrical wire stripper to cut through the outer sheath of the cable. Expose about six inches of individual wires. Use your wire strippers to strip about 3/4 inches of insulation from the ends of each wire and then place a strip of black electrical tape around the insulated section of the white wire (this is to indicate that it is being used as a feed and not a neutral). Take the electrical wire that is coming out of the switch box hole and cut it so you have about 12 inches of electrical wire hanging out of the hole. Remove a knockout on the old work wall box, feed the electrical wire through it and secure it in place with the screw-down clamp inside the box. If there is a top and bottom screw-down clamp inside the box, remove the top one entirely to allow for more room inside the box. Now, push the box into the hole so that it is level and flush and screw down the two side "wing" screws until the box is tight to the wall and secure. Strip the electrical wire and the wire in this box as you did earlier and wrap a strip of electrical tape around the white wire's insulation here as well. Now, connect the ground wire to the ground screw located on the switch. Connect the white wire to the bottom screw on the switch and the black wire to the top screw on the switch. Wrap the switch's terminals with electrical tape, secure it to the wall box using the two screws included and then install the cover switch plate. That's it for the switch part of the job. Meanwhile, back at the receptacle box, take your receptacle and use your needlenose pliers to remove the metal tab linking the two copper terminals together. Once the tab is removed there should not be anything between the two copper screw terminals. Do not touch the neutral side of the switch. Take about a six-inch length of remaining electrical wire and remove the outer sheath so only the individual wires remain. Strip about 3/4 inches of insulation from the ends of each wire. Connect one end of the length of ground wire to the receptacle's ground screw and wire nut the other end to the ground wire coming out of the wall box. Connect one end of the length of white wire to one of the silver neutral terminal screws on the receptacle. The other end gets connected to the other white wires and then wire nutted together. Tighten down the second neutral screw even though it does not have a wire attached. Take the length of black wire and connect one end to one of the copper terminal screws on the receptacle. Take the black wire from the length of electrical wire coming from the switch and connect that to the other copper terminal screw on the receptacle. Remove the wire nut covering the set of already-connected black wires in the wall box. Connect the black wire coming off of the receptacle AND the white wire with the black strip of tape (coming from the switch line) to these wires and secure them with a wire nut. Make sure all of your connections are tight and no copper is showing from under the wire nut. Wrap a length of electrical tape around the wire nut where it meets the wires, just to be safe. Wrap electrical tape around the terminals on the receptacle and gently bend the wires back into the box. Secure the receptacle to the box and replace the cover plate. Toggle the circuit breaker or breakers back on. Place your voltage tester in one of receptacle's outlets and test for power. One outlet should remain constantly on while the other should turn on and off with the newly installed light switch. That is all it takes to separate your receptacle with a switch! How do I Wire a 120V Indicator Lamp?